Today's dude ranches have modern amenities and activities to enjoy but still retain the charm of the Wild West. 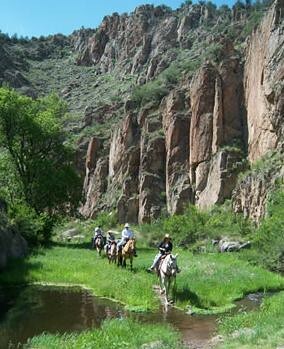 On a dude ranch vacation, you can enjoy modern conveniences while still experiencing a "Wild West" style vacation. 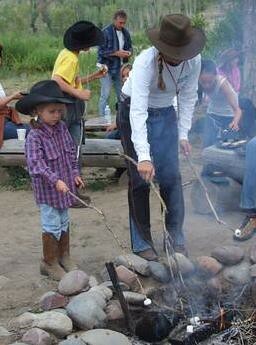 Dude ranch vacations today have activities in addition to horseback riding that appeal to guests of all ages. Among some of the newer styles of dude ranches include resorts and spas. Also, many dude ranches are now top notch luxury ranch resorts. It was the automobile that helped reshape dude ranches into the resort-style destinations they have become today. Throughout the fifties and sixties, holidaymakers took to the highways in cars and motor homes. Motels sprung up at every corner and dude ranches expanded their amenities to include swimming pools, tennis courts and spas as much as they did hayrides, square dances, BBQs and sing along. As a result, the term dude ranch has come to mean a variety of experience. But the popularity of a dude ranch vacation goes back to the late 1880s when the spirit of the Wild West was firmly entrenched in the American and European psyche. The industrial revolution was beginning to restructuring the landscapes of the East Coast and Europe and as a consequence, wealthy foreigners and Eastern industrialists, including Theodore Roosevelt, came to the West – and its dude ranches, for the abundant wildlife and magnificent unspoiled scenery. Although the expanding railroad did much to bring visitors west, it was really the lore and romance of a cowboy life that captured most people’s hearts. Writers such as Zane Grey and Mary O’Hara fuelled the public imagination; painters like Remington and Russell captivated the mythology with vivid imagery, and then with the unprecedented success of Buffalo Bill’s Wild West Show, people arrived in droves, intent to experience for themselves the thrill of an open frontier. During the 20s and 30s, dude ranch owners discovered that opening up their ranches to guests was a good way to increase their income. Their unique style of hospitality – sharing their homes, riding horses, herding cattle, hunting and fishing had become a benchmark for all dude ranch experiences. Their remote locations also led to creative socializing such as costume parties and contests; social interaction became as important as the riding and created lifelong friendships between guest and staff. Today, many of these qualities are integral to a dude ranch vacation. Although horses and the wide open range continue to be at their core, dude ranch vacations now promise to deliver a whole lot more. Research hundreds of dude ranches and find the perfect one for your ranch vacation using Ranchseeker's free dude ranch search tool.